This two-disc “Collector’s Edition” comes with a mix of extras. On DVD One, the main attraction stems from an audio commentary with director Tony Bill and producer Dean Devlin. Both sit together for this running, screen-specific chat. They discuss locations and period concerns, factual accuracy and various liberties, cinematography and shooting digitally, visual effects and visual trickery, cast and performances, story and editing, and other general production issues. In addition, we get a few trailers. This area includes ads for Copying Beethoven, Last King of Scotland, Home of the Brave and The Illusionist. 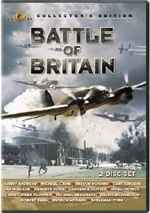 Over on DVD Two, most of the supplements come from a series of featurettes. Real Heroes: The True Story of the Lafayette Escadrille runs 26 minutes, 48 seconds as it mixes movie clips, archival materials, and interviews. We hear from Bill, Devlin, writers Blake Evans, David Ward and Phil Sears, Lafayette Foundation curator Andy Parks, pilot’s son-in-law Nick Rutgers, and pilot’s daughter Nancy Hall-Rutgers. The show looks at the history behind the film’s story. We get information about American participation in World War I and the creation of the Lafayette group. 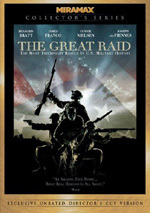 We learn some connections between the movie’s fiction and real-life inspirations as well as aspects of their service and equipment and other aspects of combat. “Heroes” provides a serviceable look at the Escadrille, but don’t expect sizzling history. Too much of the material ties too closely to the movie itself. I’d prefer something more independent – and thus with a less promotional feel. That said, we do get some nice facts here as we receive a reasonably good examination of the flick’s historical background. For the eight-minute and four-second Diary of a Miniature Stunt Pilot, we look at the miniatures used for special effects shots. Narrated by “miniature pilot Buck”, we examine the craft behind the elements and the shooting of the elements. It’s an interesting topic but the cutesy execution gets old quickly. A few decent tidbits emerge but this short is usually pretty useless. Whiskey & Soda – The Lion Mascots goes for five minutes, seven seconds and features Bill, Ward, Devlin, Evans, Parks, animal consultant Rona Brown, and actors Martin Henderson, Philip Winchester, Jean Reno and James Franco. We get some facts about the inspirations for the movie’s mascot, how they filled out the part, and how they used the lion in the flick. As with “Heroes”, this show includes a smattering of decent notes but never excels. Next we find Taking Flight: The Making of the Aerial Sequences. This 10-minute and 29-second piece includes remarks from Devlin, Bill, Henderson, and visual effects supervisor Mark Franco. As expected, “Flight” examines the techniques used to execute the scenes in the air. We see the ways the film mixed practical elements and CG effects. We get good comparisons of the various stages and receive a nice feel for the different components in this tight and useful program. During the nine-minute, three-second The Real Planes of Flyboys, we hear from Devlin, Bill, Parks, and production designer Charles Wood. This featurette looks at pilot training, the WWI-era aircraft, and recreating these planes for the film. The program stays focused on the facts and offers a nice view of the subjects. Finally, The Flyboys Ride with the Air Force Thunderbirds and the Navy Blue Angels occupies four minutes, 33 seconds. Here we see some of the movie’s actors take rides in modern jets. It’s not very interesting. In addition to the film’s trailer, six Deleted Scenes fill a total of 16 minutes, 21 seconds. We find “Toddman In Trench” (1:06), “Nunn’s Funeral” (2:30), “Cassidy and Rawlings Talk in Brothel” (3:29), “Lion” (3:44), “Rawlings Finds Lion” (2:05) and “Baseball Game & Lowry Talks to His Father” (3:26). “Toddman” proves useful as it shows how that character joined the Escadrille, while “Funeral” fills a void since the final film implies not all pilots get quality burials. “Brothel” is a tedious piece of filler, while the “Lion” clips involve a dropped subplot in which Whiskey gets removed as mascot. Lastly, “Game” fleshes out the storyline related to Lowry and his dad’s demands. That one and the first two might have worked in the final cut, but the other three deserved to be removed. DVD-ROM users can access a game called Flyboys Squadron. This is a demo for a longer product you can purchase. I gave it a quick spin and thought it looked like it might be interesting. Finally, the set includes five Collectible Cards. These offer some shots from the movie with breathless text such as “James Franco is Blaine Rawlings, a fighter pilot who proves that it’s the man, not the machine, that matters”. They’re harmless but not very interesting. Not a single original, inventive or interesting moment ever crops up in Flyboys. With an emphasis on the birth of war aviation, it could have been a fascinating take on an unusual subject. Instead, it offers the same old warmed-over tripe we’ve seen 10,000 times in the past. The DVD presents very good picture and excellent audio along with a moderately useful roster of extras. 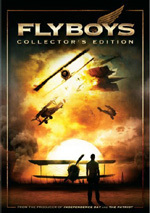 I can’t recommend the movie, and I find it tough to advise fans of Flyboys to pick up this “Collector’s Edition”. It adds some decent supplements not found on the single-disc edition. However, I don’t think these are good enough to warrant the price, as the CE costs $10 more than the one-DVD version. It’s a good package but not worth the $40 list price.